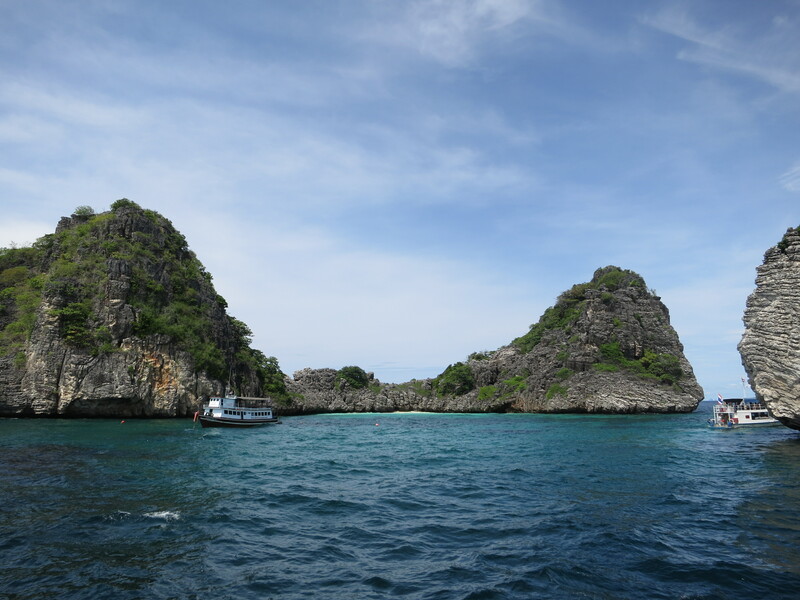 After Ko Phi Phi Don, we had two reasons to pick Koh Lanta as our next destination. First, it’s a bit more laid back – dare I say less drunk and more mature – an island than its more popular sibling. It’s an island of long beautiful beaches, but compared to the party version, those beaches have a substantially lower population density. Second, we’d heard it’s a good base for scuba diving. We hadn’t necessarily originally planned to do any diving in South-East Asia. But we found ourselves with a couple of days up our sleeve and among islands which have a reputation as one of the world’s better dive spots. And it wasn’t unreasonably expensive. So why not? We did our standard thing and checked out TripAdvisor for restaurant recommendations, discovering that the number one choice had especially effusive reviews, so we headed there for dinner on our first night. Well, we tried to head there. What we actually did was head a fair distance down the road going the wrong way in the rain because I hadn’t paid enough attention to the directions. But a short search for some free wifi eventually to, err, double-check our course had us on the right track and we found our way back up the road and then to the right turn-off to the slightly out-of-the-way L Maladee. Which promptly became my favourite restaurant in all of Thailand. It started well: the restaurant owner, a friendly Austrian lady, introduced herself and quickly asked “do you like fish?”. Given that yes please, I most certainly do, she disappeared and returned with an assistant holding a silver platter of today’s catch. That one there, please; yes, the big tasty looking one. In whatever sauce you recommend, I trust you. My trust was well-rewarded: it was so good that we went back the next night, and I did exactly the same thing. That one there, yes, the biggest one. Except this time maybe a spicier sauce: we are, after all, in Thailand. Now, I’m a big fan of spicy food. I’m not a tastebud masochist, like a few people I know: I don’t make my food as spicy as I can handle just for the hell of it. But I do like some real heat to my food when it suits the flavour, and I’ll certainly eat spicier than most. Especially if there’s a beer to wash it down with. When you’re in Thailand, ordering Thai food, you do have to pay careful attention to the ordering process when you’re specifying how hot you want it, though. If you say “fairly spicy” at most restaurants, they’ll hear “spicy as far as those silly Westerners are concerned, so maybe some freshly ground black pepper is in order, possibly garnished with an inoffensive chilli so they can pretend they’ve eaten something grown-up” and so you’ll often get something pretty bland. The other extreme is the magic phrase “Thai spicy”, which will get you something done to local standards, and you’ll quickly be calling for a gallon of milk for the kitchen and making a mental note to put some bog roll in the freezer for the morning. The nice Austrian lady at L Maladee, in any case, was practised and efficient at the elucidation of the required information. We’d overheard other patrons ordering their food; most of them after something particularly bland (there were a number of German and Austrian customers, so there was a bit of concern as to whether what amounted to the Thai equivalent of a butter chicken might be going overboard on the Scoville scale). And we’d heard a couple who asked for somewhat livelier fare, seen the waiter consequently write “30%” next to the name of the dish on her little pad, and seen that they were happy with the result. I asked for something spicy, and got it. It was delicious, but any hotter would have been difficult to eat: as it was, I was eating slowly and powering through the water. Exactly what I was after, and by the end of the meal I had a healthy sheen going and a satisfied feeling of achievement for having completed the dish. Look at me, I’m eating real Thai spice and loving it! When we got the bill, I saw what had been written next to my order: 50%. Writing percentages to figure out how hot people want their food is obviously an excellent and effective system. But if that was 50%, then I’d be impressed to see people eat up in the higher half of the range. We came away from a stunningly delicious meal with the conclusion that, basically, food in Thailand comes in three different levels of spicy – “tourist”, “a bit”, and “what real men eat, not like you, you piddly little pretender”. I suspect that I would struggle with anything in the third category. Really our only other activity for the short time we were on the island – other than an obligatory but brief and largely unexceptional exploration by scooter – was the scuba diving. Which is basically a long-winded excuse for: my description of the dives isn’t going to be very good, even though the dives themselves were a lot of fun. The site that we went to is called Koh Ha, I can definitely accurately relate that part. It’s a group of five small islands an hour or so’s boat trip from Koh Lanta. There’s a sort of lagoon area created by the islands, in the centre of the group, and in the dives the company had done for the past few days, there’d been one of a particularly rare species of eagle ray – a white-spotted eagle ray, my dive log tells me – sighted in the lagoon. So the grand hope for the day was to find it again – and there was much general excitement and waving and pointing and enthusiastic bubble-blowing when we did fairly shortly after getting in the water on our second dive. We enjoyed following a turtle around for a while on our third dive, as well, and the semi-enclosed cave in which we surfaced on our first dive was an entertaining experience. The marine life throughout was pretty; nothing much large and spectacular, but a lot of littler fish and shrimps and other small-scale life on the coral. And it was good to be back under the water. 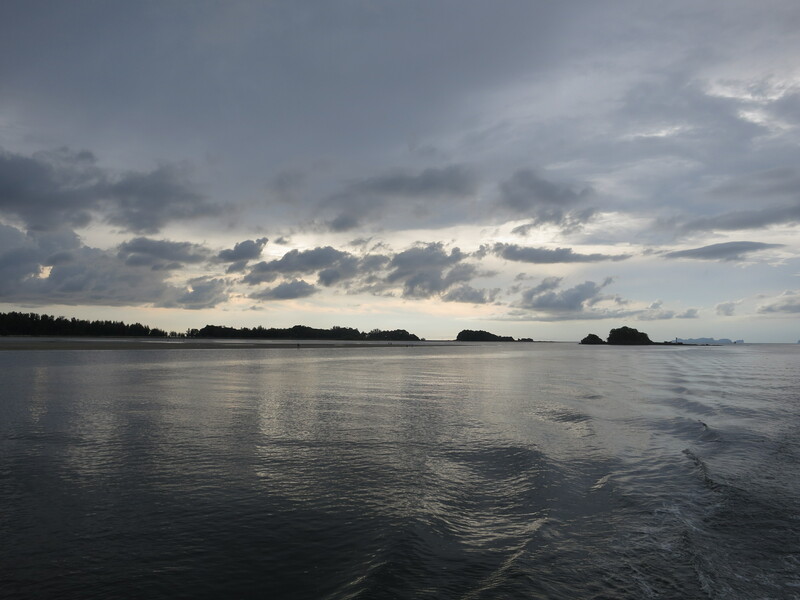 Which meant that our mission (such as it was) for Koh Lanta was successfully completed, and we could move on to the slightly different environment of Phuket. This entry was posted in Travel and tagged koh lanta, thailand by Sam Roberton. Bookmark the permalink.